Key difference: The major difference between the two is their purpose and functionality. A ‘Netbook’ is a small sized laptop version especially designed for content consumption, such as listening music or watching movies, etc. ; while a ‘Notebook’ is a small sized laptop designed for the actual content makers, or for the ones who perform heavier or big tasks such as, video or picture editing, etc. The advanced technologies and development have given rise to more and more comfortable equipments. Workaholics like the technologists are striving hard to invent more and advanced type of electronic gadgets, which tend to reduce the manual work and there by speed up the intellectual work. Nowadays, computers and laptops are more privileged gadgets. Laptops where designed for specific purposes are known as Netbooks and Notebooks. Technically, a ‘netbook’ is an underpowered computer in a ‘notebook’ form factor. Netbook is a small sized laptop around 10 - 11 inches, and is highly portable with full computing platform and tactile keyboard. As its name suggests, the portable device works totally on Internet. The best factor about the device is, it is highly convenient to use and hence can get accommodate in smaller spaces. Netboks works on windows operating systems; hence they are a perfect choice for the individual’s who actually wants to play with windows applications. The netbooks are good for the one time applications which work on internet connections; like listening to music, watching online movies, videos and etc. As these have limited applications, they were famous when they were launched, after that their demand and popularity went on decreasing. 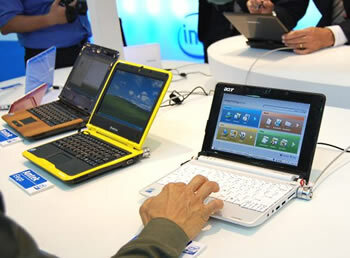 Notebook is a smaller laptop having big screen sizes as compared to that of the netbook, which ranges from 13 - 14 inches. 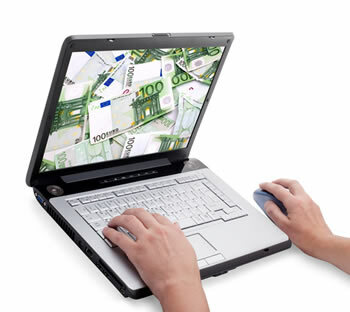 These are purposes oriented laptops, which consists of all applications and activities. Notebooks were designed for the business industries, or for the ones who want to roam from places to places carrying their work with their selves. These are portable devices, which provide lots of usability. Notebooks are mid-range machines which are used for all the office related works. They are highly advanced as compared to netbooks, because they perform all functions related to a netbook also to that of a computer. Notebooks with powerful graphics card 3D gaming system are also available in the market. In electronics, netbook and notebook have become a part of original considerations. The netbook is less developed and only task oriented than notebook, which is more advanced in real computing power and functionality. Notebook is more developed, as it is highly application oriented. Both netbook and notebook differ in their sizes. A netbook do not have same ports and adaptors for connections in comparison to a notebook. Due to which, the notebook can be connected to any projector or screen in order to give a presentation, while the netbook cannot be connected, due to lack of ports. A netbook can be preferred by regular travelers, surfers, the ones who browse a lot, or for the search engine optimizers who are limited with same type of tasks. While, a notebook can be recommended for the ones who actually work on high job profiles, and have large works to deal with including from the origin of work or content up to the final presentation. Netbooks are small, lightweight, legacy-free, and inexpensive laptop computers. Notebooks are heavy-weighted packed with more connections and peripherals than netbooks. Ethernet and Internet connection required, but even without that the other works and applications can be carried out. It’s a combination of all. Do not have same ports for adaptor or projector. Does have ports for adaptor and projector connections. regular IT workaholics, business owners, content developers etc.